The Colby students arrived on campus having never taught a class before in their lives. They had written many lesson plans prior to their arrival without full knowledge of the level of the students they would be teaching and without many common points of reference. 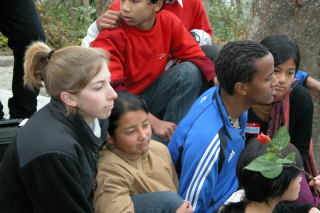 After the initial three days or so (which were additionally challenging due to a complete lack of a working schedule of classes), they quickly adapted to their new environment, refined their lesson plans and capitalized on their discoveries regarding the knowledge level of each class and the commonalities of our two cultures. I am especially proud of my two Colby violin students (L & E), who did some excellent work with the violinists in grades 3-8. They exhibited creativity, patience, a command of their subject, and a real degree of caring for their students. These are attributes of first-rate teachers! I think the Colby students were surprised at how the Gandhi Ashram students immediately accepted them as teachers (although they were better behaved when their regular teachers were present), and the freedom with which they expressed their affection. Groups of young children would “attach” themselves to a Colby student, grasping their hands, hugging their legs (the most readily available part of the body at kid-level), and generally openly expressing a joy at being in their presence. The general happiness level of these children was remarkable. Most of them have absolutely no worldly possessions to speak of, except for the clothes on their backs. Their happiness came from enjoying the simplest things (a valuable lesson for us all). The Colby and Gandhi Ashram students (and we faculty) established a very strong bond during the three weeks of our stay there. Everyone was very sad on the last day. When talking with the Colby students, the most predominant comment I heard from them was “I can’t believe how much energy it takes to teach! I’m absolutely exhausted at the end of the day!” I asked one Colby student about his experience and what he would take home with him upon leaving. He mentioned that he wanted to visit each one of his teachers (from grade school through high school) and thank them for their patience, guidance and the caring given to him as a young student. 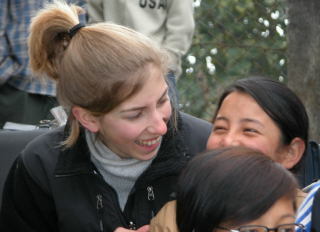 We also talked about the difference between students at the Gandhi Ashram School and students in the U.S. This Colby student expressed his belief that most American students tend to have a sense of entitlement regarding their education, whereas the Gandhi Ashram students knew it was a rare gift for them. Maybe that’s why they all made way for us on the pathways as we walked to class or meals, saying “Good morning, Sir (or Miss)”. 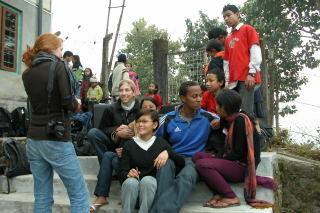 For my part, I truly enjoyed my time with the Colby students during India JanPlan 2008. I believe the students signing up for a trip of this nature (living with and teaching students in a third country) would necessarily possess a certain set of values and outlook on the world. In my opinion, these values set them apart from the majority of students and other residents of the world. 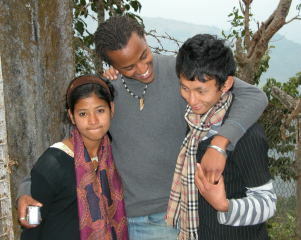 I thank them for bolstering my hopes and outlook for the future of our planet! Unlike some JanPlan courses, which almost seem like a vacation in comparison, this course has a real “grit under your fingernails” appeal. It is my perception that in other JanPlan courses, the students go to different countries and see many things, almost from a tourist’s perspective. This experience was more hands-on (another sentiment expressed to me by many of this year’s students). 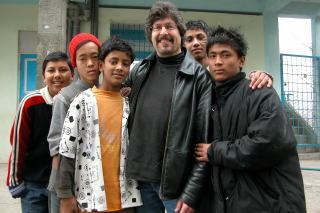 In order to teach these children, one had to wash away the cultural differences and reach them on a human level. For myself, it was once again affirmed to me that we humans are really very much the same worldwide. We have our hopes, desires, fears, strengths, weaknesses, etc., but at the end of the day, we want to take pride in and be accepted for who we are. We all take solace in our personal religious and philosophical beliefs and find joy in the company of others who love and accept us unconditionally. Bravo! Beautiful sentiments, beautifully stated.